This month, we honor the families and professionals who work on behalf of children and youth in foster care. This year's theme is "Empowering Caregivers: Strengthening Families". Find a host of resources for families and for recruiting and retaining foster or resource families HERE. May is also Mental Health Awareness month and this first week of May is designated Children's Mental Health Awareness Week. On Thursday, May 4, the US Substance Abuse and Mental Health Services Administration (SAMHSA) hosts National Children's Mental Health Awareness Day. See our Q & A below for more resources for the week, month and all year round. We Sprang - Spring Forward Family Fun Day was a Success! Thank you to all the families who shared the day with us and made family fun a priority. We could not have done it without our sponsors: NewFound Families of Virginia, For Children's Sake of Virginia, First Home Care, PEATC, INTotal Health, and Fairfax County Neighborhood and Community Services. We greatly appreciate the bunches of GMU student volunteers, led by our fearless spring intern Ms. Courtney Boone, who jumped in and helped with everything from registration to playing games to creating pipe cleaner spiders. Go Patriots! Seats Left for Three Lucky Middle School Students! Formed Families Forward is offering LifeSkills Training to middle school students, FREE of CHARGE! Students must commit to six sessions. Dinner served and gift cards to teens who participate. Get the event FLYER HERE. LifeSkills Training for Middle Schoolers - Register! Join Presenter Marjorie MacArthur Veiga, founder and editor of www.MyLymeGuide.com. Learn how to use websites, apps, and smart devices to set reminders; manage tasks with school officials, doctors, and other professionals; track patients' symptoms and medications; and other family management tools. Hard copy, paper-based methods will also be covered. Free and open to all interested parents and caregivers. REGISTER HERE. Q: When I Google mental health treatments, I seem to find a lot for adults but not so much for children and teens. Do you have suggestions? A: As noted above, May is Mental Health Awareness month, so it is a great time to identify resources for addressing mental and behavioral health issues. These groups offer resources specifically for children, teens and adolescents, and their families. Closer to home, Formed Families Forward hosts a webpage with mental health resources for foster, adoptive and kinship families dealing with mental and behavioral health challenges. There are several sources of information about what research says about specfic treatments and interventions for children and youth who have psychiatric or other disabilities and special needs. Regardless of the intervention suggested for a child in your care, treatment providers should be able to offer research evidence that supports use with children or youth with similar conditions or needs. "May" We Share These Trainings & Events? May 4- Community Matters Children's Mental Health event and Paper Tigers screening, hosted by Trauma-Informed Community Workgroup of the Prevention Alliance of Greater Prince William, Woodbridge. May 5- People with Disabilities Encounters with the Criminal Justice System, hosted by the Arc of Northern Virginia, Falls Church. May 6- Family and Youth Leadership Summit hosted by Virginia Family Network at NAMI of Virginia, Richmond. FFF will see you there! May 10 - June 14- LifeSkills Training for Middle School Students. Wednesdays in Fairfax. 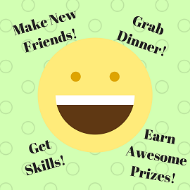 Free activities and dinner for middle school students! May 10 - National GrandRally: Building a Community of Hope to raise awareness of grandparents and other relative caregivers, Washington, DC. Contact us if you are interested in joining a Virginia bus, stops planned in Henrico, Spotsylvania, and Alexandria. May 10 - State Complaint Procedures workshop, hosted by PEATC, Springfield. May 12- Calming the Anxious Waters workshop hosted by Fairfax County Public Schools Parent Resource Center, Dunn Loring. May 17- Control the Clutter: Turn Piles into Files workshop by Marjorie MacArthur Veiga, hosted by FFF, Fairfax. May 18- Mindful Parenting: Remaining Calm While Improving Family Dynamics, hosted by Loudoun County Schools Parent Resource Services, Ashburn. May 19-21- Project Life Statewide Youth Conference, Midlothian. May 23- Understanding the Impact of Trauma: What to Do at Home and at School webinar, presented by FFF Director Kelly Henderson, hosted by PEATC. June 1- PEATC Advocacy Symposium with VDOE, in Richmond. June 9- Family Movie Night at FFF. Screening of Resilience for adults; kids get their own movie! June 29- July 2- NewFound Families Campference for families and professionals, Glen Allen. A conference for parents, caregivers and professionals, while children enjoy day camp. FFF will see you there! Virginia Family Network is hosting an Advanced Parent Leadership Training May 20 - 21 in Winchester. Free! Know middle school students who could benefit from Life Skills? Formed Families Forward is offering LifeSkills Training to middle school students, FREE of CHARGE! Sessions run Wednesdays, May 10 - June 14, 5 - 6:30 PM. Dinner served and gift cards to teens who participate! Learn more HERE. LIKE Formed Families Forward on Facebook and get the latest news, event notices and information just for foster, adoptive and kinship families!